← Steak & bacon stew! 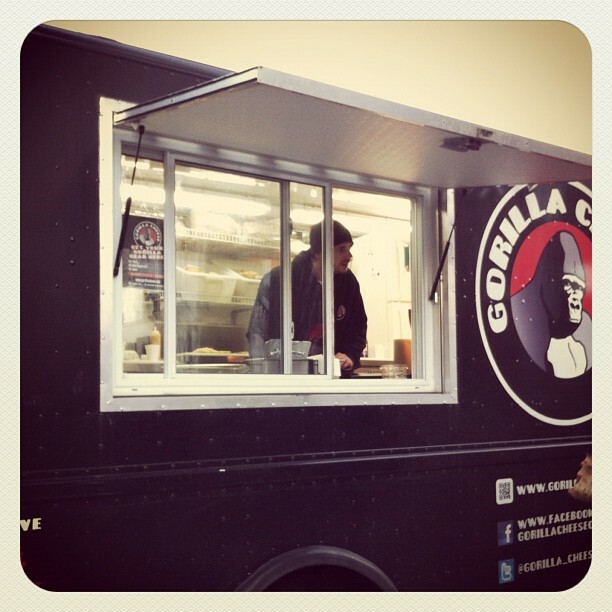 If you live in the Hamilton, Ontario area, you have likely heard of the Gorilla Cheese truck. If you haven’t… what rock have you been living under?? Seriously, though, point your browser at www.gorillacheese.com, twitter.com/gorilla_cheese and/or www.facebook.com/gorillacheeseonfb and see what these cats are all about. They tweet and Facebook their weekly schedule, so keep your eyes peeled. This black food truck emblazoned with Gord, a gorilla, on the side, cranks out some serious grilled cheese sandwiches. No, they’re not on fancy bread. The bread is great, sure, but it’s simply a vehicle for all the yumminess they pack between the slices of bread. Are you a ham-lover? They have a sandwich for that. Bacon and maple syrup fan? Yep, there’s a sandwich for that. Pulled pork? Oh yes, you heard me right. Their menu changes from time to time, but some staples seem to be the Lumberjack (a personal favourite), the Sarducci, the Bubba and the O.G. (original grilled cheese, I think? ), just to name a few. The Lumberjack is stuffed with apple slices, bacon, cheddar and maple syrup. Yes. Bacon, apple and maple. What a fantastic combination. I recently tried the Hammer, which had ham and honey mustard in it (I believe there was apple in that too). Now, I have to confess, I was talked into that one. I’m not a ham or mustard fan by any stretch of the imagination. I avoid ham at family dinners and hubby and I just threw out a bottle of mustard that had been in our fridge (at the very back) for so long, I was considering charging it rent. But the Hammer was delicious! I would likely get it again. The Bubba is loaded up with cheese, mouth-watering pulled pork and coleslaw. Again, I’m not a coleslaw fan, but man, this sandwich was tasty.Very filling but very tasty. I’d recommend it to anyone. And I found it had a bit of a kick at the end, but then, I have sensitive tastebuds. Tonight’s dinner contained two Lumberjacks and their elusive, homemade tomato soup. They don’t have the soup every time and I’ve been hearing for weeks about how good it is. After a week of relatively nice weather, we’ve had a sudden cold snap, so it was the perfect day for soup. I just lucked out that the Gorilla Cheese folks had some soup available. It’s served in a styrofoam cup and I believe it was only $2.50. They should be charging more. This was the best tomato soup I’ve ever had — a lovely puree of herbed tomato soup that is fresh, warming and comforting. I wish I had bought two cups, honestly, then reheated the second one for tomorrow’s lunch! 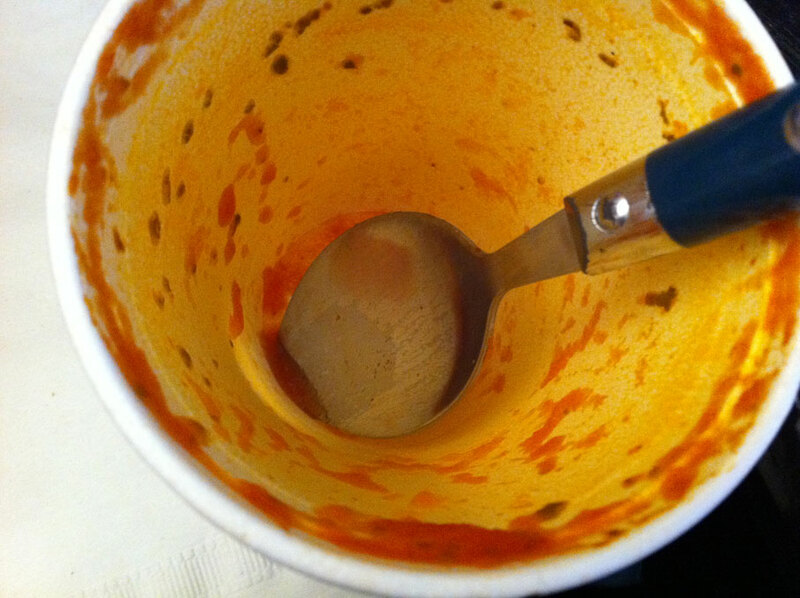 Oh, and did I mention that I have always despised canned tomato soup? This is not canned. This is the real deal. Look at the picture: do you think I enjoyed it?? Bottom line here is that everything I’ve tried has been to die for. It’s good, old fashioned comfort food out of the side of a truck. There is nothing about that which I don’t like! And the staff are just wonderful, sweet people. You’re always greeted with a smile and you’re always treated as though you’re an old friend. After a few visits, you’ll probably be surprised that some of them remember your name, or at least your face! 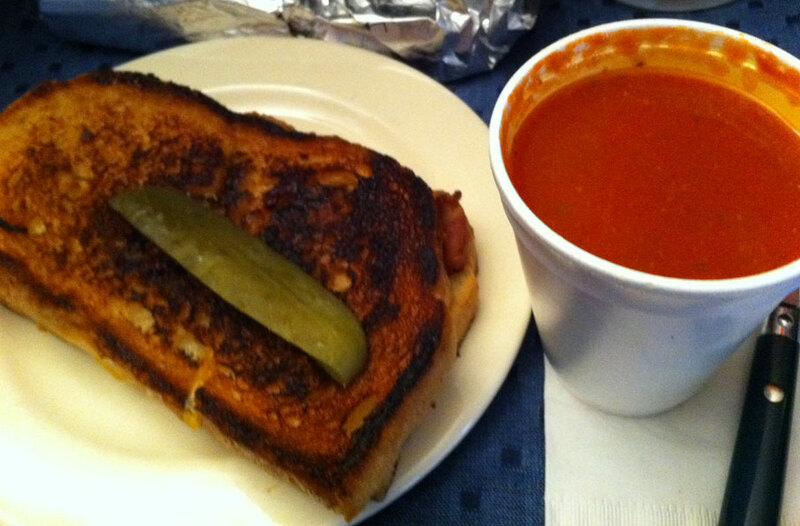 This entry was posted in dinner, review and tagged apple, bacon, cheese, grilled cheese, maple, tomato, tomato soup. Bookmark the permalink.